While most telcos around the world have been preparing for 5G, little attention is paid to B2C services in this regard. Most developments are focused on various vertical industries. However, telcos haven’t been quite successful in B2B use-case areas; most of their revenues have come from the B2C mass market. Since telcos have lost their service power against OTT1 and O2O2 platforms, they have fallen into bit-pipe in LTE. To avoid repeating this, they will need a head-start to win the race to develop the first real-to-virtual, virtual-to-real (R2V) platform for the market. 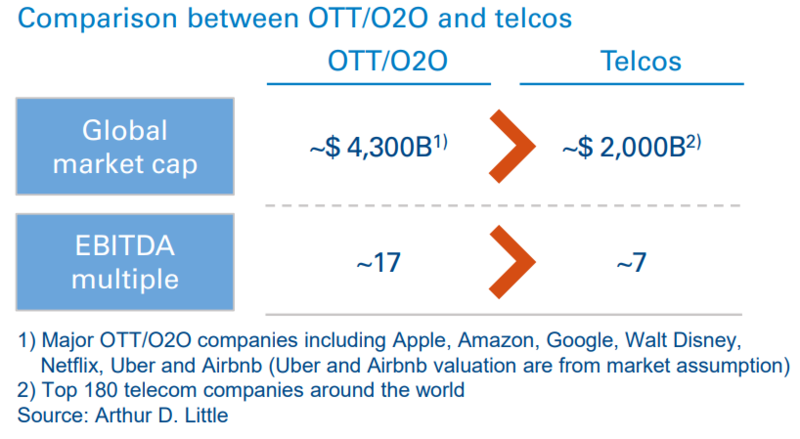 Since service platforms such as OTT and O2O have played key roles in the mobile ecosystem, their market cap and EBITDA multiples have been much higher than those of telcos. The end of upside potential driven by the number of subscribers and ARPU31 is in sight for telcos, but not for service platform players. Though 5G has started globally, fundamental questions such as killer services, optimal form factors for devices, types of service platforms and potential winners are left unanswered, and neither are they big agenda items in the ICT world. This is why most 5G developments have been focused on vertical B2B use cases. However, the major market for telcos is still the B2C mass market, so we need to bring those questions to the table. The current killer service for LTE is 2D video streaming, which allows customers to watch any type of video-streaming information created by a media player or user. However, this will no longer be the case with 5G. Since the data rate of 5G will be multiple gigabits per second (or more), it will be able to provide 3D video streaming. 5G 3D video will not be the same 3D TV that failed several years ago. 3D TV was dependent on media players creating 3D video content. Media content providers were not able to invest in 3D content due to the limited size of the 3D content market, much like in the “chicken and egg” game. Unlike with 3D TV, the main content of 5G 3D content providers will be customers and machines at the early stage. Customers will be able to talk over 3D video with others and watch 3D videos created by other customers and machines. This primary purpose of communication will be the initial foundation for 3D video. After customers’ acceptance of 3D video communication, new types of 3D videos, mainly focused on media and entertainment, will follow. However, for this to be technologically feasible, there are two prerequisites we must address: whether 3D video will be the killer service for 5G as 1) a form factor of 5G devices, or 2) a new type of service platform for 3D video. Current smartphone technology, initially developed by Apple and followed by many other global OEMs, is the best form factor for 2D video streaming services. However, the smartphone is not the right device for 5G, for three reasons. First, smartphones do not allow us to watch 3D video unless they can generate hologram images. Hologram display seems to be a very long away from becoming commercialized. Second, smartphones only show us a very narrow vision of what 3D video requires. Our eyes have a 170-degree view of 3D images, and what we see needs to be uploaded to a platform, where others can experience the same. Third, the user interface (UI) of a smartphone is touchscreen based, which, of course, is a big hurdle for a hands-free UI. For a hands-free UI to work, the technology will need to support voice and gesture. Wearable devices could be a great solution to overcome these hurdles. For a person to watch 3D video, the display needs to be very close to their eyes. Thus, a glasses-type wearable device would be the best 5G form-factor. The race to develop a glasses-type device has already started among global device OEMs such as Apple, Google, Microsoft and Samsung. They have set their own milestones, and made investments to acquire core technologies to commercialize decent light-glass devices. 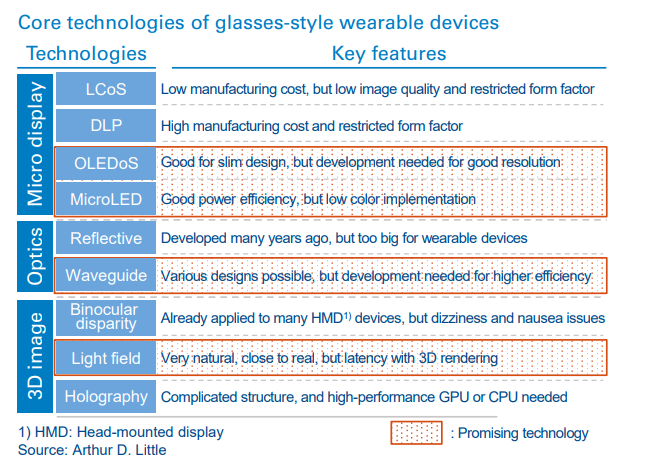 For a glasses device to be feasible, three core technologies must be further developed and incorporated. The first is micro-display technologies such as OLEDoS, Micro LED, LCoS and DLP. For light and high-quality display, OLEDoS or Micro LED would be the best solution. The second includes optics technologies such as reflective and waveguide. For light form factor, waveguide seems to be the optimal solution. The third involves 3D image technologies such as binocular disparity, light field and holography. For comfortable 3D viewing, light field seems to be best. Though it will take time to roll out good light glasses-style devices, as core technologies are developing quickly, we will live in a post-smartphone era soon. For 3D video, whether virtual or actual, a service platform needs to be developed. The new type of platform that will allow customers to enjoy augmented reality or virtual reality should provide real-time conversions between actual and virtual information, as well as rich storage of virtual content backed up by artificial intelligence (AI)-based big data analytics. An R2V platform should be able to collect real-time information on various objects, such as roads, buildings and stores. For example, if a customer is wearing a glasses device while looking for a place to have lunch, real-time information about the menu, prices, seat availability, rating, etc., will be displayed via the device when they look at a restaurant. In addition, an R2V platform should develop a virtual content ecosystem ranging from commerce and games to media. This kind of virtual content will be displayed to customers independently or jointly with actual/augmented content. Form is nothing other than emptiness; emptiness is nothing other than form. An R2V platform would prove this principle by providing realtime conversion between the real and the virtual. Killer services using an R2V platform will be 3D communication, virtual commerce, augmented search, and games. 3D video communication will enable us to be virtually one meter away from anyone anywhere in the world. We will not need to drop by offline retail stores to look around and try on goods when virtual commerce is launched. Virtual commerce will provide more diverse and personally fit goods with a more enhanced shopping experience. This will result in big value migration away from current offline retailers such as department stores, flagship stores and category killers. Augmented search will be another killer service. Most content will be pictures or videos containing real-time explanations. This augmented search will enhance appropriateness, exactness and reality of the information, while getting quickly to the point. Virtual gaming is already commercially available with HMD devices. Current virtual games are purely virtual. However, R2V gaming will provide an experience mixed between real and virtual. Pokemon Go is an early-stage R2V game with limited experience of virtual. More enhanced games and content will be developed on an R2V platform. 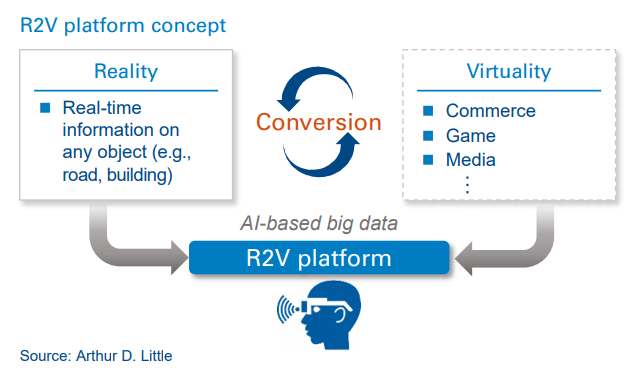 In order for a company to develop the winning R2V platform, three key components are needed: reality as a strength, virtuality as a strength, and real-time conversion between real and virtual. Four core competencies will lead to a winner. First, real-time access to offline objects such as roads, buildings and stores is the main pipeline of real information. Machine visioning connected to a central database will play a key role in generating useful real-time information. Second, a strong AI engine that analyzes the real-time data and provides insightful information is a prerequisite. There will be many use cases for an R2V platform; thus, an AI engine needs to provide appropriate information case by case. Lastly, a strong conversion engine between real and virtual information will be key for an R2V service. For example, when we look at a restaurant, real-time information, as well as virtual settings in the restaurant, need to be overlaid. This kind of conversion between real and virtual information will save customers more time. It is very early to predict the winner in the race to develop an R2V platform. However, potential winners can be categorized into: 1) telcos, 2) current OTTs, 3) media players and 4) “dark horses”. Telcos seem to have strength in reality. They have an edge with real-time access to offline objects through their current network access to the last mile. However, given that telcos have not been successful in platform play so far, it is questionable whether they can build up other core competencies. Besides, telcos have limited coverage outside of their territories. 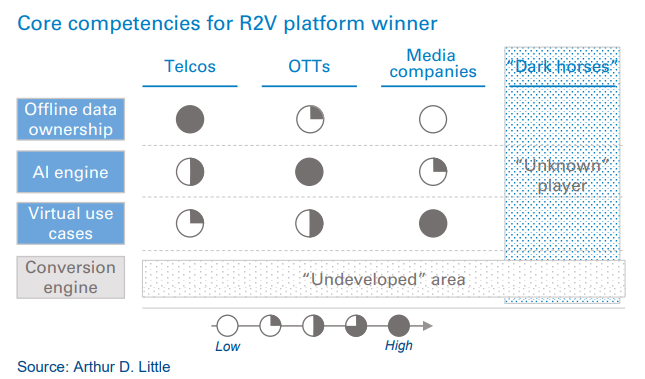 If telcos around the world could form a global R2V platform, coverage issues would be resolved. Global telcos’ associations, such as GSMA and 3GPP, would be good entities for a global endeavor. Current OTTs such as Google, Facebook, Naver, Kakao and Baidu are strong in the area of AI engines, some real and some virtual. Google, for example, has one of the most advanced AI engines, which could be leveraged for R2V platform service. Google also has an advantage in reality in terms of Google Maps and big data collected throughout Maps’ presence. In addition, the company has formed new ecosystems for new services. This kind of rich heritage in building up new ecosystems would be helpful for virtual content. Equipped with good storage of media content and experience in media platforms and global-scale play, media players are also strong candidates for developing an R2V platform. Global media players such as Netflix, Disney, Time Warner and Vivendi can leverage their expertise in virtual content and 3D. As revolutionary services emerge, “dark horses” including innovative ventures or global vertical players such as Amazon, eBay, Airbnb and Uber could also develop winning platforms. These could develop very innovative conversion engines for reality and virtuality. These engines would play key roles in differentiating quality of R2V services, given that most content is uploaded by third parties. 5G will unfold a new revolutionary world of 3D media to the B2C market, fundamentally changing the way people live and the current ecosystem of the ICT world. Unlike 3D TV, 5G 3D video will start from 3D communication, increasing the odds of widespread 3D acceptance. A new form factor for 5G devices, most likely glasses-style, will fuel this big change. A race to develop the first of such a device has started, and it is too early to predict the winner. R2V will be the next platform on which reality and virtuality will converge. An R2V platform will have a significant impact on offline businesses. There is still much potential for various types of players to be the first developer of this future platform technology. Telcos could get out of bit-pipe if they get a headstart in this big race.